Grime, waste, pollution. Cold, rigid frames aspiring to ultimate utility. Growling machinations in a dimly lit warehouse with no sign of sunlight. When we think of factories, beauty’s usually not the first thing to come to mind. But as this list reflects, that couldn’t be farther from the truth. The following is a list of 25 of the world’s most unique. Beauty in factories can mean many things. Exterior design. Interior functionality. Environmental efficiency. Landscape layout. If anything, it’s probably impossible to precisely quantify. What’s unique: One of the top spots on our list is reserved for a piece of architectural history. Designed in 1925, the Van Nelle Factory is a series of interconnected buildings that relies on natural light flowing through its sheer windows for its distinctive look. Workers made coffee, tea, and tobacco. Experts consider the building to be ahead of its time in its design and in the function of its design. Providing industrial workers with natural light reflected a level of concern for the laborer that was rare in the early 20th century. When Rotterdam was bombed during World War II, Van Nelle survived. In fact, meetings planning the reconstruction of the city were held in the factory’s offices. Van Nelle was named a UNESCO World Heritage site in 2014. The factory is considered one of the most important industrial monuments in the Netherlands. What’s unique: The Transparent Factory is made to be flashy. The majority of its exterior is made of glass, allowing visitors and even passerby to see some aspect of production. But the name is a double-entendre: it also symbolically refers to the company’s transparency in its production process, and its willingness to be open. Similar to Aerzen, Volkswagen reflects its principles in its design. However, Volkswagen does understand that even transparency can be misleading. An outdoor speaker system broadcasting in “bird language” keeps critters from crashing into the glass. The factory’s walls are made out of glass…its floors are covered entirely in Canadian maple. And its layout is visitor-friendly, set up to receive, per day, 250 tourists (by advance reservation at 5 euros each), customers, or prospects (gratis). What’s unique: Aerzen is the first Gold LEED certified manufacturing plant in Pennsylvania. That’s the highest environmental accolade that a building can receive. Aerzen was completed in 2008 after a creative design process called a charette. The final result is a building that runs entirely on solar energy. Sunlight shines throughout both the factory and the offices. The walls are made of plastered straw bales and the surrounding landscape is a carefully restored wild meadow. The pastoral atmosphere reprieves the typical tediousness of an industrial setting. Maybe its best feature? A rooftop garden with a rainwater recycling system. The plants serve as insulation. It involved breaking the building into components. And having teams of vendors, engineers, architects, and outside consultants work with Aerzen executives to brainstorm possibilities both within and outside of their field of expertise. What’s unique: For Herman Miller Furniture, beauty leads to profits. According to its architects, the factory and office building, known as the GreenHouse, is designed to be “visually and physically integrated with the site.” This means that the building was planned to fit into the landscape as naturally as a tree. Sheer windows provide consistent daylight throughout the structure. Its most boastful feature is The Street, a hall that runs the length of the building and connects all offices and manufacturing spaces together in a single, streamlined, industrial ecosystem. As attractive as the pictures of Herman Miller’s GreenHouse are, the real story is in the numbers, which are mind-boggling. About 45 million pounds of parts, materials and packaging come into the plant every year. Amount of waste sent to landfill every month: fifteen pounds. They don’t waste time, they don’t waste materials, they don’t waste energy, they don’t waste anything. What’s unique: Distinctive brown panels melt into the desert-like environment. Wood columns line the stark yard. The Olisur Olive Oil Factory somehow manages to be both rustic and futuristic at once. Its design is meant to mimic the older, practical residential architecture of the central Chilean valleys. The structure is made of concrete coated by wood and glass. The entire structure, including all factory materials, is made of biodegradable materials. It poses itself above the soft tree-lined areas, peeking gently with its facades of wood and tones that highlight the luminosity of the place. The body melts down as one with the geography and projects the lines of trees upon his facades. What’s unique: While many factories seek to transform the typical warehouse feel into something that melds with the landscape or anticipates the future, BMW decided to stick to the past. They retained a traditional office and a traditional factory and united them into one complex. The way the factory is intertwined into the office building is meant to unite the workers together towards their ultimate goal: improving the business. From corporate spaces on higher levels, employees are able to see manufacturing processes through sheer windows on the bottom floor. A vast interior square, called the nerve center or the communications knot, is accessible from all levels. The design aims to deconstruct conventional white collar/blue collar spatial divisions. What’s unique: Sitting on the edge of a lake, the exterior of the McLaren factory curves in a long S. The height was intentionally limited to minimize the structure’s visual impact on the environment; passerby can still see the trees over the top of the building. Originally designed as strictly an office, the original building was doubled in size to include a production space for automobiles, qualifying it for this list. It is also deceptively massive: the interior of the entire structure is large enough to store nine Boeing 747 Jumbo jets. The opening ceremonies of the building were presided over by UK Prime Minister David Cameron. 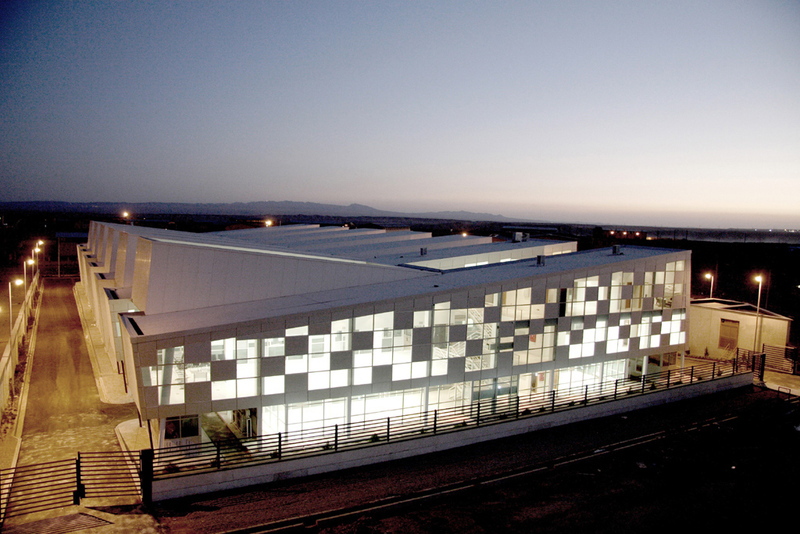 The linear arrangement of the two-storey structure mirrors the flow of the production line: components are delivered; the cars are assembled, painted and tested, and then pass through a rolling road and car wash, before leaving the building. What’s unique: FRABA Sp z.o.o. is a prototype, the first of a breed of similar plants that have since been created in its image around the globe. An automation components manufacturing plant, this site was curated with the local region in mind. Triangular skylight domes cover the ceiling, meaning daytime operations are lit by the sun. The design of the triangular ceiling mixes aesthetics with business purpose: the architectural positioning of the roof optimizes the space available. The design reacts to location specific construction and logistic conditions for each site. In Poland there is a sufficient supply of timber at considerable low costs compared to a conventional steel structure. What’s unique: Brilliant colors line the walls. Paneled wood floors, shining like a basketball court, line the walkways and safe zones throughout the complex. This Vysota warehouse wouldn’t be out of place as part of an amusement park. You probably wouldn’t guess that it’s a pipe rolling factory. The bright design of ChelPipe’s production facilities is a part of the company philosophy called “White Metallurgy” which is based on a corporate culture and production system. The philosophy brings to life a transformation of industrial design, work and social environment, and identity. We believe that beautiful and comfortable interiors improve labor productivity and company morale, influencing the attitude of employees towards work and increasing their engagement in business. With wood-paneled walls, amber-gold brewing vats, and rustic, spiral staircases leading from production floor to production floor, the Anchor Brewing Factory has the feel of something from a fairy tale. Halls of shining brewing vats seem part alchemy, part . Indeed, the historic brewery was founded at the height of the California gold rush by a prospector who turned his sights to suds instead. The current factory is a re-purposed coffee roasting plant that was built in the 1940’s before being turned into one of the nation’s first microbreweries. It’s wholesome, fun, and bohemian. What’s unique: The ground smokes with fog. The curving wall holds dials, nozzles, tangled metalworks that vanish around the bend. The sheer scale of this (formerly) top-secret rocket factory is frighteningly beautiful. It appears to surrealistic and sci-fi-esque that when photos of it first appeared on the Internet, cynics claimed that it must be photoshopped. But the Khimki Rocket Factory is very real. It is located just outside Moscow and pictures are forbidden. However, one intrepid photographer, Lana Sator, snuck inside and snapped several shots, including this one. The plant belongs to NPO Energomash, a leading manufacturer of military-grade liquid propellant rocket engines. But this apparently decrepit factory is far from abandoned. NPO Energomash builds rockets that power the modern Soyuz, the Zenit 3SL, and the Angara and Baikal launch vehicles. Their RD-180 engine powers the first stage of the Atlas V, an American rocket, and they have strong ties to the Russian military – which has one of the biggest arsenals of nuclear armed ballistic missiles in the world. What’s unique: Nothing’s more American than baseball, and few, if any American factories are as distinct as the Louisville Slugger factory. The home to one of the sport’s oldest and best-known equipment manufacturers, this factory runs its production facility side by side with a museum that pays tribute to company history and the legendary athletes that rose to greatness on the wings of its product. The bat at the front of the structure is free-standing, as if balanced there by some passing ogre, just finishing one more pick-up game. An iconic creation is at the heart of this factory. A wooden baseball bat is important to anyone who has ever played the game or swung one at one time or another. The beauty of this factory stems from the fact that it is built just a long home run from where the first bats were made. From the street, the building looks like it’s been there from the beginning and all that is different is the six story bat leaning against it. Stepping back is the connection from new to old, leaving a void to appreciate the scaled replica of the bat, before the remaining portion of the factory steps forward again in its complimentary brick and storefront expression. Inside the factory, the visitors are allowed to witness the creation of new bats after they pass through a simulated forest, they are treated to historic moments in the game and are allowed to use replica bats of their favorite players in a batting cage. The way that this factory not only manufactures wooden bats for use all around round, but provides a public experience of it all is pretty remarkable. What’s Unique: It may be hard to imagine an electronics factory as a beautiful thing. But imagine the inside of a clock working, and you’ll have a good idea of what the Amberg Siemens plant actually looks like in the middle of the day. The Siemens plant was also the winner of the 2007 “Best Factory in Europe” award, given by the French Business School INSEAD. It’s practically impossible for the human eye to follow the extremely rapid movements of the machines in the Amberg Electronics Manufacturing Plant (EMP) as they stamp chips, transistors, resistors, and capacitors onto blank circuit boards that fly by on conveyor belts. What’s Unique: A maze of finely polished wood steps and painted white railings leads to the brewing floor of Anhauser-Busch, which appears less like a factory and more like a library. An array of solar panels on the roof – over 7,000 photovoltaic units covering 130,000 square feet – are responsible for up to 10% of the entire brewery’s power on an average day, making them one of the most significant users of solar power in the nation. Newark was our first branch brewery. Today the brewery is known for its animated flying eagle sign. The Eagle, intertwined w/ the red capital letter “A”, appears to fly as 4,500 feet of neon lights flash in succession. The sign is perched 250 feet atop the brewery, has become a Newark landmark over the years. The sign can be seen by interstate traffic as well as by Newark International Airport airline pilots and passengers. The round sign is 34 feet in diameter, 6 feet deep and rotates clockwise. It weighs approximately 15 tons, a bit heavier than an average school bus. There also is a horizontal Budweiser sign on the side of the Brewhouse that faces south and a vertical Bud Light sign faces north. What’s Unique: The headquarters of Ireland’s flagship beer have become a flagship destination in large part thanks to the tour of the factory within. Guiness’ beer itself is an international icon, and they would not suffer commercially if their headquarters were in a modern, common factory. Beer lovers from around the world would still come to taste their product and marvel at its creation process. But in keeping their old factory, they’ve made an important choice. Beautiful is in the eyes of the beholder, and since the eyes are someone’s who appreciates history and the value of maintaining the historic fabric of a community, I think the way that Guinness choose to restore their flagship rather than rebuild new is, in their terms, ‘brilliant!’ The decision to keep the old walls and refresh the inside tells a lot about the character of the company and warrants the respect of not only historians but their peers. Guinness appreciates their history enough to embrace it and embellish it with modern amenities such as a new roof top restaurant, new museum and new tasting room. The character and charm of each follows suit with the delicious brew that is brewed within the historic walls found in Dublin. -John Marshall, Architect and President, Marshall Sabatini. What’s Unique: No list of mind-blowing factories would be complete without the sprawling warehouse floor of US Air Force Plant 4. Dozens of next-generation fighter jets are spread across the room in various stages of completion. The spirit of World War II-esque production is crossed with the cutting edge of aerospace technology including new weaponry and stealth design. This factory is currently the home of the production of the F-35, the world’s most advanced fighter jet. For its sheer mass, and for the apocalyptic way in which it all comes together, few factories can match Plant 4. The plant includes 8 million square feet of industrial floor space (the government owns 84%). It is a self-sufficient and self-contained fabrication and assembly operation. Facilities include a high bay structure and flyaway capability (from adjacent Carswell AFB). Support functions (logistics, engineering office space) are conducted from onsite trailers and leased offsite space. Wandering through the Atlantic coastal hills of Spain, lush green vegetation dominates. The location of the Rioglass Factory in Lima is on the brink of a new eco-zone, where colors begin in change in magnificent ways. The design of the plant mirrors this brilliant clash. Inside, there is no traditional sharp distinction between factory space and office space, lending the plant an egalitarian feel that the designers believe will promote cooperation and efficiency. The sudden contrast between the yellow, arid high plains of Castille and the green opulence of the Asturian vegetation is astonishing. One of the main motivations of the project was to transmit this sensation, trying to integrate the factory within the landscape. What’s Unique: A historic and cultural gem of Denmark, Bang and Olufsen are one of the world’s oldest producers of HiFi, audio accessories, TV’s, and other electronics. Their warehouse is distinct for its artistic interior and its appearance as two elevated rectangles facing each other across a lengthy courtyard. B&O’s corporate headquarters looks more like a museum of contemporary art, or at least a very cool furniture store, than a factory where HiFi gear is produced. The Paykar factory was built to satisfy the incredible demand of construction projects sweeping the region. The panel manufacturer wanted not only to provide enough product but also to create something entirely unique and new. The result was a 3700 square meter open space with a 350 square meter mezzanine overlooking the production floor. Adjacent to plant area are showrooms and offices that are only a short walk from the main floor. Experts say that the site has served as a prototype for other similar plants and even for architecture in the entire Iranian nation. Paykar is located just kilometers from the capital in Tehran,in an manufacturing city reserved for non-polluting industry. The industrial revolution in Iran has taken shape and structure from designs such as Pykar panel factory. We are hopeful for environmentally aware, non-pollution factories. What’s Unique: Boeing creates some of the world’s largest, most-critically acclaimed, well-known jetliners. It’s production floor is a maze of moving jet pieces and workers, centered by the massive frame of the single aircraft being produced. During World War II the plant served as the production site for the B-17. Over its history its seen visits from dozens of world leaders and dignitaries, including President Clinton. From 2005 to 2009, the Everett site implemented the Future Factory project to create new, open and desirable work areas in the main factory building. The goal was to enhance collaboration, improve the employee experience and support overall production efficiencies. About 4,000 people moved into 600,000 square feet (55,741 sq. m.) of renovated space in five office towers. Because of its size and magnitude, the Everett plant represents Boeing to the world. What’s Unique: Sleek, svelte, and strictly efficient: that’s what defines the factory floor of Britain’s renown car maker Aston Martin. The warehouse is a mirror of the cars it produces. All-white walls and tables are attended by mechanics and designers dressed in white scrubs, polishing and tinkering the undercarriages of shining vehicles. The understated elegance of the factory aims to mimic the shiny hoods of the cars it produces, a simple exterior covering a intricate power. The dynamic architecture and the elegant materials used in Aston Martin’s Gaydon headquarters in Warwickshire, England underline the quality of the design and finish of the cars produced there. The building is the embodiment of Aston Martin and its cars, reflecting the power of the idea, the aesthetic and inner beauty of technically advanced solutions and the very soul that comes from hands that create pure sports cars. What’s Unique: Two towering red spires, made of glass, stand up from a bare plain in rural Brazil. From miles in any direction, the edifices comprising Nestle’s warehouse are broadcasted to the public eye. The towers are an addition to the existing chocolate factory, and are meant to accommodate both workers and visitors to the landmark and to improve the flow of traffic throughout the site. 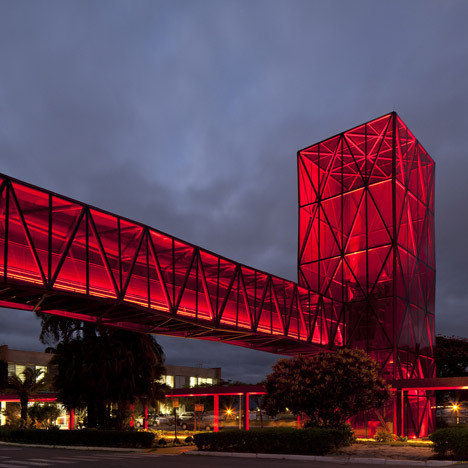 The main intention of the design for Nestle factory’s visiting areas was to create a landmark in the generic landscape of the highway that connects São Paulo and Rio de Janeiro, revealing the existence of a public and accessible space. What’s Unique: It’s not a mosque, it’s a cigarette factory. Stranger words may have never been spoken. But in historic Dresden, designers found a way to juxtapose industry and religion. This distinctive structure, known as the “tobacco mosque,” was created in 1886 and its design is owed to unusual codes in the central area of the city which prohibited the creation of anything that looked like a factory. The appearance of the factory was so distinct to commuters on the nearby rail that the name of the original brand posted on the side of the structure, “Salem Aleikum,” became a household name in that region of Germany. Consequently, the building would not only meet the requirements of the city council but also become a distinctive advertising monument for oriental cigarette brands. –Yenidze Historical Association ding’s official site. What’s Unique: An intricate outdoor maze of stainless steel walkways, exposed piping and exhausts are lit brilliantly into the night by hundreds of yellow lights. The plant is home to Shell Nanhai, a subsidiary of Royal Dutch Shell, the oil giant. The plant is a partnership between Shell and China National Offshore Oil to produce petrochemicals. Though that may sound ominous for the environment, the plant produces its own electricity and contains a complex system for managing and treating effluent waste. It is the largest petrochemical factory in all of China. Developed in response to the rapidly growing demand in China for petrochemicals, the $4.3-billion project involved one of the largest ever start-ups. The processing complex covers 2.6 km2 and will yield around 2.3 million tonnes of product per year. What’s Unique: Looming over one million square feet and containing over a thousand employees on its factory floor alone, Intel’s Fab 32 plant in Arizona is truly the headquarters of a technology giant. The main floor contains 184,000 square feet of clean room space, which will help to create tens of millions of energy-efficient processors. These processors are based on Intel’s groundbreaking transistors with Hafnium-based high-k metal gate silicon technology, the biggest change to how transistors are made in 40 years.